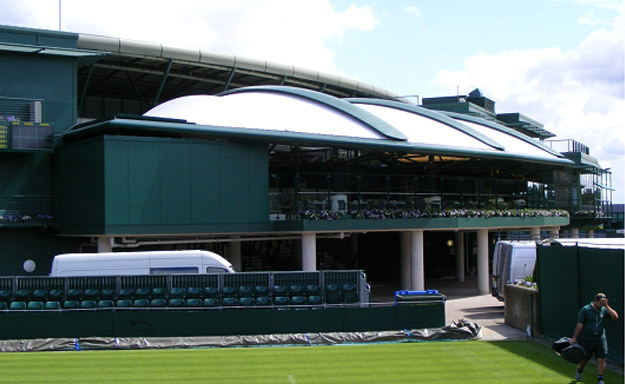 In September 2010 A J Tensile were asked to look at designing a pair of almost identical canopies on the South East and South West corners of Court No.1 at the All England Lawn Tennis Club, Wimbledon to cover new bar and restaurant areas for debenture members. Following an initial design review and project meetings with the architects and main contractor, A J Tensile was contracted in late November 2010. Detailed design and engineering of the fabric canopies was completed by early January 2011, at which point fabrication works commenced. Installation of the first canopy began in mid-February, with the second following in early March. The whole project was completed by the end of March.